The April SEO Newsletter is hot off the presses, and this month, we talk about the development of online business and the Internet marketing industry in India, with some interesting facts and a special guest interview with the managing director of Bruce Clay India. We also discuss the mutually beneficial relationship of an agency and in-house marketer, and how the two together can create stellar SEO plans that actually strengthen the strategy versus just having one or the other working on the plan. Today, we’re going to talk about the development of Internet marketing globally with some additional thoughts on the topic by Bruce Clay. We’ll look at how the progression of the discipline varies from country to country, but almost always follows a pendulum-type swing from full-service agency to consulting and back again, as the knowledge and skills transfer from the experts to the in-house marketer. Then we’re going to give some insight on what businesses should look for when first partnering with an agency in order to help facilitate the natural progression from agency knowledge to in-house implementation. India is a developing country and booming in so many ways. But we must remember that business in India, especially when it comes to digital business and online marketing, is still serving a very specific niche. I sat down with Bruce yesterday afternoon to talk about the state of search in India. He painted a picture that gave a new perspective to the needs and wants of the people in India as it relates to business and digital access. First, he reminded me of the caste system. He painted a picture of the business sector in India, from the cardboard-lined, chain-link fenced-in shack that sells goods to the 10-story building down the street. The caste system is very evident in the business community, and only the wealthiest companies will be interested in digital marketing. Of those companies who are beginning to embrace digital marketing, Bruce says that it’s a much more attractive option to many of them to hire Western agencies. This is because they believe these types of agencies have more knowledge and skill when it comes to SEO. This is also why Bruce Clay India had a waiting list of clients in the country before it even opened the doors for business. The idea that spam techniques prevail in India is being challenged by more sophisticated techniques. Bruce Clay India has had much success with implementing White Hat practices for its clients in the Indian business community. In the April Back to Basics article with Siddharth, he talked about the lack of training and industry support for professional growth in India; not only the lack of search conferences, but also the lack of training options. Bruce followed up by saying there is sometimes a lack of funding and support for professional SEO training in India for a couple reasons. The first is that many of the companies in India that are known for Black Hat techniques are assembled with professionals who have little understanding of the discipline, who aren’t paid very well and who also often target Western companies as clients. These types of businesses are likely not interested in White Hat SEO best practices in the first place, but even in they were, lack of training resources and funding would probably hold them back from pursuing it. However, those businesses that are savvy and see the value in long-term, quality SEO strategies are desperate for Internet marketing education and are willing to pay top dollar for it. Last year, Bruce Clay India held its first SEO training and hosted a packed class. Some of the businesses with were able to send more than one employee and the passion and enthusiasm for learning, says Bruce, was incredible. This is why, as a company, we’re pleased to offer this knowledge to the professionals in the community who so desperately want to learn it. 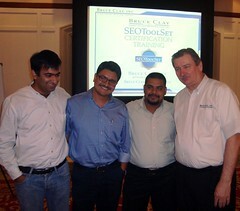 On August 2, 2011, Bruce Clay India hosts its second three-day SEO training in Gurgaon, India. In the Q&A with Siddharth, he stated social media was going to continue to grow in India, along with the further adoption of SEO and e-commerce, as society begins to carry out more transactions online. Bruce reminded me that we must keep in mind the economy and development of India as a whole when thinking about the need for digital marketing. This echoes Siddharth’s commentary on how India is mostly a cash economy, and therefore e-commerce is a very new concept. Social media and mobile Internet usage, Bruce says, will continue to grow in India. But when we think of the reasons behind this use, we must keep in mind why it’s popular and then create our marketing plans around that. The growing use of social media can likely be attributed to the need to stay connected with people across India and over the world. This need is in addition to the population who uses it to engage with brands in India, as we learned in this month’s Back to Basics article. When you think about some of the more rural areas of India, you can see how perhaps human connection can be very appealing. This is especially true as many of the Indian people aren’t staying in one location their whole lives anymore; they are migrating to other cities and areas of the country and the world. Recent stats show India is second to the U.S. in mobile Internet traffic. This comes as no surprise when you realize that many people can more easily afford and gain access to the Web through a phone versus setting up a personal computer at home. In developing countries, mobile Web is an attractive option for many. In fact, Siddharth shared a stat in the article from a recent conference he attended. Keynote speaker Rajan Anandan, vice president of sales and operations at Google India, said 66 percent of online customers are researching about “mobile phones” in India. In my conversation with Bruce, he described the progression of Internet marketing worldwide as a pendulum swing. When Bruce Clay, Inc. launched in 1996, we were a full-service agency for many years. This is because in-house marketers had no knowledge of how to implement it on their own. As the years passed, we began to see more companies hiring SEOs in-house, and as a company, continued to transfer knowledge to in-house marketers through SEO training and partnerships with clients. This moved Bruce Clay, Inc. from a full-service agency, where we implemented SEO for clients, into a consultancy, where we worked with clients to teach them how to be successful on their own. Until recently in the U.S., Bruce says, we were at the far end of the pendulum swing at consultancy. Now we are beginning to swing back to full-service with the shift in focus to local search optimization and other new trends. Europe is not far behind the U.S. on this. The opportunity as agencies is finding ways to provide long-term SEO success to the new clientele entering the market: the small business in need of local search optimization. Typically, these types of businesses have far less resources and capacity for managing online marketing in house. And so we begin again with the pendulum swing. In the Australia search industry, Bruce predicts it will begin to swing from full-service agency to consultancy in about another year or so. India still has a few years before it makes the same transition. For companies that are just getting their feet wet with mixing in-house expertise with outside agency knowledge, there are some important things to keep in mind in order to be successful. In this month’s SEO Newsletter feature, Susan Esparza talked about the give-and-take of the agency and in-house partnership. Competitive advantage. David says companies will often hear a lot of the same similarities in strategy in the sales pitch across agencies. The key is to dig to find out what the differentiator is of each agency from the competition before deciding on which to partner with. Client retention. Because a lot of agencies experience high turnover with clients, it’s important, says David, to identify those agencies that have long-term client retention. This showcases trust in the agency. These long-term relationships are also the most beneficial for knowledge transfer form the agency to the business. The takeaway: look for an agency that can be a business partner versus just vendor. Overall ethics. Identify how the agency works within the guidelines of Google, says David. Find out what their stance is with ongoing and recent updates from search engines. Uncover whether or not the agency is proactive with taking steps to tweak strategy to stay ahead of the game and comply with search engine updates. David says he always reminds people that the website is the door to their business; there is much more at stake than just a failed online marketing plan if the website is penalized by Google. It’s not worth the risk for short-term gains found through Black Hat techniques. If you have yet to hire an in-house marketer, an article at Search Engine Watch on how to hire an in-house SEO offers some good tips. Please share your thoughts in this post in the comments below! Learning definitely is one part, the other one being unreasonable expectations on part of the clients. You would agree with me that not many Indians are capable saying “no” to clients and they agree to most of what they ask for. When these expectations pile on, you do not have much choice as content creation, natural link building and citations (for Places) would take time to get. That is where most of the Indian SEOs will start using blog spam and wiki edits as spam tactics. I am sure they do not even know to go beyond these and use anything advanced even in BH. The thing is we still take SEO as a technical game rather than a marketing discipline. The day we Indian SEOs become better searchers and are able to develop detailed and high quality query databases, we will become better link builders too…if not complete SEOs. And BTW, thanks for your comments, I appreciate your participation. Thanks for reading our blog. My interview actually focuses on the huge potential in the Digital space in India. You mentioned that I reference “black hat” a lot but the fact is that in my interview there is only 1 place that I have mentioned “black hat” and there too I have qualified that by saying it is mainly due to lack of quality learning programs in our country. I have not claimed that we are the only ethical seo company in India, however I am certainly proud of the fact that we do follow ethical seo practices. Also I would like to point out that things are moving in a positive direction as conferences such as Adtech & our own Bruce Clay SEO training program along with a few other programs come into India. As learning from quality sources spreads amongst digital professionals it will be a huge positive for our industry. We need to remember that India offers a huge opportunity with its over 100 Million Internet users. Let us capitalize on this opportunity. Thanks for sharing your perspective Jessica. I am sure that just like Bruce Clay, BC India too is doing a phenomenal job at adopting white hat strategies and still being efficient in terms of ranking high, qualified traffic and conversions. I would like to register for your Aug training session to get a glimpse of what is being taught and how they (your team India) adopt these practices. If the preachings are way off, I sure won’t be amused, but if they adhere to what they teach, I may want attend and see more of your Indian team. Hi, Ashish. Thank you for the added perspective. It’s nice to hear from others because no story is one-sided. It seems there are a lot of misconceptions about SEO in India, and I was hoping this article would clear that up. Personally, I don’t feel it’s painting a negative picture, but highlighting the opportunities for the search industry to become more involved with marketers there, and a need for mass education for businesses about Internet marketing. Nonetheless, everyone’s opinion is valid here. I welcome more discussion on this topic. Thank you for your comment! The article seems to be biased towards proving India knows nothing or very less about SEO and digital marketing overall. Black hat has been referenced a lot by Siddharth and it appears as if Bruce Clay thinks of itself as the only Indian company which offers ethical SEO services. If that is true in India, it is true in China, UK, Canada and US too. A handful of individuals who are either desperate for success or have limited understanding of the subject matter try to game the system as and when possible. This however doesn’t means a country is carrying our black hat spam tactics. , I am sure you will find better approaches to success on web as compared to what has been portrayed here. There is no doubt that in these days SEO industry is booming in India and hope India has good future in the same industry. Raj! Thank you for the great comment! Nice to see you here on our blog. We are pleased to be a part of India’s SEO education and honored you would travel that far to take it! Kudos for being the first in your region. Speak with you soon. This article is wonderful…Yes Indian business people and professionals are concentrating more on SEO,SMM and Internet marketing,But they understand this is an ongoing process and one can not get results in 2 to 4 days. Also i notice may people in India say SEO professional and they do not know 100% about SEO, they follow the techniques which we say Black Hat, there must be 2 reason for this 1) Press for boss to bring their website top 2)Lack of knowledge. Bruce Clay thanks for your training in India i missed my seat last year and hope i will be there in this august.Also come down to South India there are many SEO guys who are waiting to learn from the leader. I am going to travel all the way 2000kms to reach this place for training. Also i will be the first person from South India to get this training from Bruce clay academy, I am proud…Meet you there Big “B”. Hi, Paul — I’m glad you enjoyed it, because I sure enjoyed learning more about the industry there myself. A lot of misconceptions were cleared up for me as I was speaking with both Bruce and our managing director in India, Siddharth. Thanks for your comment! Great article…I’m glad to see the industry emerging and evolving into something tangable. god to see article on seo in india ….